Many of you use the MetaFlows Security System to monitor cloud-based instances. Agents running on the instances send their network packets to the sensor for inspection. We now report the real time bandwidth each agent produces. The sensors which receive network traffic from agents will now have a clickable button that reveals the agents’ statistics. Clicking on the button, will open a table with each agent IP address, the source port being used and the Kbps being sent. These stats change in real time. Hovering will reveal some passive host discovery information (DNS, MAC, DHCP info, HTTP Agents, Proxies, etc). Clicking on each agent IP will open up an historical report for that IP to see what that instance has been up to in the last day or so. And, ho, yeah.. we added some links on the dashboard. One can be used to rate us for Amazon (30 seconds survey) and one for Gertner (this will take you 10-15 minutes or so but they give you a $25 gift card). We would appreciate if you could give us feedback. Feel free to contact us if you have any questions. Happy Hunting! MineMeld is an open source threat feed management system that gathers IP addresses, URLs, and domains which pose a significant network security threat. The threat feed sources can either be free, subscription-based or proprietary. MineMeld re-scans the feeds at regular time intervals and continuously aggregates and updates the set of all threat indicators to be consumed by fierwalls, IDS/IPS, or any other security device. MetaFlows now includes MineMeld public threat feeds to augment our existing intelligence sources. The public threat feeds amount to about 200,000 additional indicators updated every few hours. Users also have the ability to add site-specific (either subscription-based or private) MimeMeld sources. IPv4 and URL/Domain indicators are treated differently. MineMeld IPv4 addresses are compiled in a set of IDS/IPS rules designed to alert or block communications to blacklisted addresses. MetaFlows uses a proprietary technique to quickly look through this huge list of addresses (140,000+) and therefore does not require specialized hardware for hi-speed networks. The MineMeld IPv4 feeds are in the mmreputation.rules configuration file that can be accessed through the existing IDS rule management UI. The feeds are not activated by default but users can activate them in IDS or IPS mode with just a few clicks. If enabled, these rules can be very useful to detect and/or prevent communication to questionable hosts on the Internet. All the IP addresses are reduced to approximately 40 separate signatures. Each signature corresponds to a specific feed source (for example blocklist_de) or intersections of sources where the IPv4 address is present in more than one source (for example blocklist_de_alienvault.reputation). This decomposition provides additional operational awareness that can be used to prioritize which set of IPs to alert on or block. Enabling or blocking individual signatures therefore affects a dynamically changing set of potentially thousands of IPs updated every few hours that map to a single threat feed or the intersection of multiple threat feeds. Users also have the option of adding site-specify MineMeld IPv4 feeds to enable additional commercial MineMeld subscriptions independently purchased or other proprietary feeds. Entering the URL as shown above, will automatically add the custom MineMeld reputation feed into the customer’s configuration and the local rule corresponding to the feed can then be managed as the other public MineMeld feeds. A user receives an email containing a malicious URL or link to a malicious domain whether or not the user clicks on the links. When either of these two conditions occur, a high priority even is generated that can be used to block those specific communications. There is also a an additional option to enable real time email notification. When bad emails are detected, users also get a warning email instructing them to discard the email. MineMeld support will automatically be added next time your system self updates or if the sensor software is restarted. Traditional network intrusion detection systems (IDS) generate alerts by finding known threat patterns within a single TCP session. This is very blunt. Important events (A3) are often missed due to the high volume of false positive alerts (A1). To be effective, traditional IDS need constant tuning and expert analysis. Multi-session correlation is an evolution of dialog-based correlation extended to leverage diverse global threat intelligence. Simply put, it automatically connects the dots between notable TCP sessions between a single internal host and multiple external hosts over time. It produces incident reports containing multiple events related to the same threat (A2+A3) rather than giving you independent alerts. This works much better, it will save you time and money in defending your enterprise. You can try it on your network for free. Register at nsm.metaflows.com and build your own network malware detection appliance within minutes. All you need is some decent hardware with 2 Network Interface Cards and a span/mirror port from your switch. Author livioPosted on January 8, 2019 Categories TechNewsLeave a comment on What is Multi-session Correlation? The easiest way to deploy a Network IDS to monitor your AWS instances is to setup a Linux security gateway. It does require some amount of IP networking knowledge but it is a very flexible way to manage your cloud assets as if they where in your LAN. The EC2 security gateway routes IP traffic between the VPC and the Internet and therefore has complete visibility of the full-duplex traffic to and from your protected instances. The Network IDS running on the EC2 gateway instance will then allow you to identify and shut down threats as if it was deployed in a physical network. Launch a VPC (Amazon’s virtual private cloud network) and give it a non-routable network range (ex. 10.0.0.0/8). Your VPC will need a private subnet (ex. 10.1.1.0/24) and a public subnet (ex. 10.1.100.0/24), if you do not already have two subnets then go ahead and create them. Launch a Linux EC2 instance on the public subnet of your VPC to be your network gateway, this will probably be the only instance on the public subnet for most deployments. Any Linux OS should be fine, but we prefer and use examples from CentOS. Your gateway instance will need to be assigned at least one Elastic IP Address (EIP), this will be the public address that people will use to reach your network and the gateway will map that address to the correct instance on the private subnet. You will need to modify the network adapter for your gateway instance to DISABLE src/dst Checking, this is required for it to properly function as a router. The above commands first give you a root shell (required to make networking changes), second tell the system to forward network packets that are destined for other networks, and third act as the source for all network traffic originating from your private subnet. EC2 will automatically assign an address to your instance, that is part of the public subnet, once it is launched. Each instance can have additional IP addresses on the public subnet. For each of these IP addresses you can assign an Elastic IP Address to correspond to it, thus allowing your router to receive traffic for multiple public IP addresses and route it to multiple internal private hosts. Limits may apply depending on the type of instance you choose. The public subnet should have a default route (0.0.0.0/0) to an amazon Internet Gateway device. If your VPC doesn’t yet have an internet gateway, you will need to add one for the public subnet. The private subnet should have a default route (0.0.0.0/0) to the public facing interface id of the gateway instance. Do not add a route for your private subnet to an amazon Internet Gateway Device, otherwise they will route through it instead of your Linux gateway. If you haven’t already, launch the EC2 instances that you wish to be monitored in the private subnet. If you want to deploy an advanced commercial network IDS in your cloud environment I suggest you take a look at our turnkey solution. It does not require setting up a Linux gateway and provides an unprecedented number of advanced features not available in open source systems. The MSS now fully supports the Qradar SIEM from IBM in CEF log format. Qradar is an excellent SIEM but requires classifying and mapping every event type it sees to an internal category. Qradar comes with a large number of common IDS rules (~50,000) already classified but not mapped. Besides having to manually map all these rules Qradar-MSS users would also need to continuously create additional Qradar IDs (Qids) to map to the much larger rule set used by the MSS (which changes daily). All this required a mechanism to update Qradar dynamically as new rules are published. With this update released today, no manual classification or mapping operations are necessary. The MetaFlowsCEF log source automatically parses the 13 event types generated by the MSS and presents them in the Qradar default view. All MSS events are automatically mapped to new or existing Qids without any user manual operations. This makes the Qradar SIEM much easier to use. Verify the import was successful and assign the MetaFlows sensors to this log source. Also make a note of the log source ID assigned by Qradar to the MetaFlowsCEF log source (something like 400[1-9]). Edit the file mss.sh of all sensors and add the line export QRADAR=1. On one of the sensors you designate as the main Qradar updater, create the file /nsm/etc/qradar.ini to allow the sensor to communicate to the Qradar server (see an example below). Also add the line export QRADARLOGSOURCEID=<logsourceid>; where <logsourceid> is the number you noted in step 3. Probably something like 4001, or 4002, etc..
server_ip is the IP address of your Qradar box. The Qradar updater sensor will automatically add to Qradar new IDS rules added by the sensor’s rule update (which will be the same across all your sensors). This will happen through the Qradar API in the background as the sensor is running. The first time, the updater is run, it will have to catch up with about 50,000 definitions; so it will take many hours. Subsequent updates will take less time. After each Qradar update, the email associated with the sensor owner will receive a summary of the update process. Qradar integration is a bit complex; so do not hesitate to contact support@metaflows.com for any questions. Then configure your sensor as a server and make sure to add its static IP address in the sensor configuration. After restarting the sensor, you will be able to connect in server mode using Websockets. This has been awaited for some time. 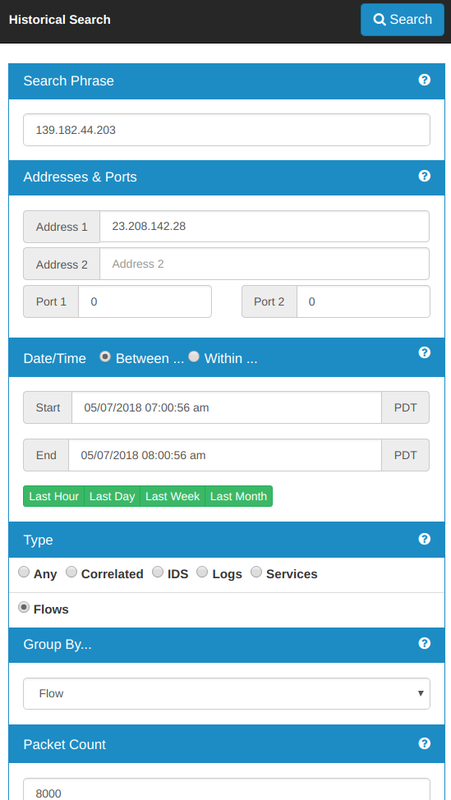 The MetaFlows Security System now detects proxied connections. The original IP is swapped with the proxy IP so that it can be correctly identified in the events. This has a dramatic effect on correlation since most proxied hosts only proxy http and use their real IP for DNS and other communications. Using the real IP for correlation and analysis will correctly correlate IDS http events and file downloads with IDS events and service discoveries triggered by different protocols. When a proxied host is detected, a message of the forms xff=<realip><-<proxyip> is appended to the event and the proxy IP is replaced. So, you will see the real IP not the proxy. When you analyze the packets data, the system automatically switches back to the proxy IP to look for the packets containing the proxy IP rather than the real IP (since the packets are stored before the IP is replaced). Notice that when we detect a proxy a P is associated with the proxied host. This feature will be available as soon as your sensor is restarted or self-updates. Let us know if you have questions. From the app you can either drill down on Splunk itself or jump to the MetaFlows console to gather more forensic information like packet payloads. You can install the app by using the Splunk application management tools. In order to send event to Splunk you need to add a configuration line in your /nsm/etc/mss.sh startup script of your sensors. The SSL-encrypted syslog messages are sent to the MetaFlows Splunk App through TCP port 3015 (please make sure you sensor can communicate on this port). It is a early beat version, please let us know how you like it. It has been all over the news this weekend, a surge in Ransomware under the name ‘wannacry’ that has the potential to cripple large portions of networks due to the way that it spreads. This is a pretty stealthy piece of malware at the network level, little to no CnC has been confirmed, but at an individual level it doesn’t behave much differently from any other Ransomware that we have seen in the past. This worm like behavior makes it particularly dangerous. While usually* smb (port 445) is not accessible from the outside world, it is often completely unrestricted within a local network, allowing one infected machine to spread the Ransomware across an entire site. * This is your reminder to do double check firewall rules and run some external scans to make absolutely certain your windows file shares are not reachable from the outside world. MetaFlows has added 2024291 to our priority alerts category, and may also add 2023218 to add an extra level of alerting for these events. There are likely to be more updates and more information soon as researchers have time to study the samples collected so far. Our primary signature provider, Emerging Threats, maintains a mailing list where these issues are discussed as they unfold.